Miss Baba Beaton wore this dress when she married Mr Alec Hambro on 6 November 1934. 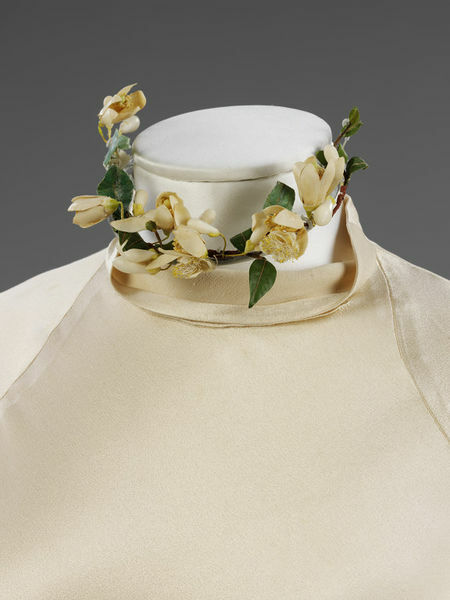 It is an early example of the work of the designer Charles James. It anticipates later developments in his style, particularly his approach to complex cut. The beauty of the design lies in its deceptive simplicity and the designer’s complete understanding of the potential of the fabric. Darts and seams shape the smooth ivory satin, which clings and drapes around the body in order to enhance the graceful figure. James said, ‘all my seams have meaning – they emphasise something about the body’. Although he was born in Britain, James worked as a milliner and custom dressmaker in New York between 1924 and 1929. In 1929 he opened premises in London. During the early 1930s he travelled extensively between London and Paris, establishing a Paris branch in 1934. Like Elsa Schiaparelli he was a friend of the Surrealist painter Salvador Dalí and made use of Surrealist influences in his designs. A documentary film that explores the future of clothing. Watch as we meet with some of the most innovative companies on the planet to get their opinion on clothing and its future, including: heroes of sustainability, Patagonia; tech-clothing giants, Studio XO; sportswear icon, adidas; and Biocouture, a consultancy exploring living organisms to grow clothing and accessories.